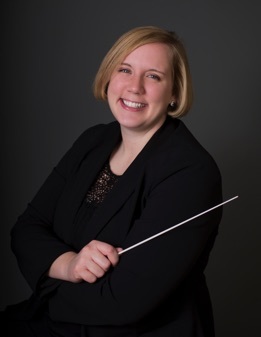 Lindsey Bogatz is currently a Band Director at Elkhorn South High School in Elkhorn, Nebraska. At ESHS, Lindsey co-teaches Marching Band, a 10-12 Concert Band, and a 9th Grade Concert Band. She also conducts two jazz bands - Blue Sage and Southwinds - and teaches private lessons before and after school. Additionally, Lindsey teaches privately across the Omaha metro area, with many students auditioning successfully into honor bands and consistently receiving Superior ratings at festivals. In addition to her teaching duties, Lindsey conducts her hometown Beatrice Community Band, serves on the board and plays tuba for the Omaha Symphonic Winds, and plays in the 1st Nebraska Volunteers Brass Band and the Nebraska Brass Band. In May 2016, Lindsey graduated with a Master of Music in Conducting from the University of Nebraska at Omaha. At UNO, she was involved in all aspects of the band program as a teaching assistant and played tuba in multiple ensembles, including the Symphonic Wind Ensemble and Heartland Philharmonic Orchestra. Before returning to school, she taught middle school vocal music at Dawes Middle School in Lincoln and K-12 Music in rural Kansas. Lindsey received a Bachelor of Music Education from the University of Nebraska-Lincoln in 2010. While at UNL she performed in the Symphonic Band, Wind Ensemble, Tuba-Euphonium Ensemble, Big Red Express Pep Band, and the Cornhusker Marching Band, for which she served as a Rank Leader and Drum Major. Lindsey has been married to her husband and music teacher colleague Doug since 2011. They live in Bennington with their cats Penny and Boots and their dog Bosley.